I didn’t have any clue what Lucky Miles meant until I saw it at the end of movie. It is title of a new Australian movie to be shown this month at Sydney Film Festival. Surprisingly a Filipino plays major role and top billed at beginning of film credits. Guy’s name is Kenneth Moraleda who invited us to see an advanced screening. Family gladly tagged along. We were at majestic Dendy Cinema at Circular Quay, right under the Art Deco pillars of the Big Toaster (a giant monolith of a hotel built in the throat of island protrusion where Sydney Opera House sits). Here’s where I caught up with Ken. He played Arun, a Cambodian refugee, which is a major role in this black comedy movie involving human trafficking, human nature, human tragedies and human compassion. Australians can take care of themselves…in so many different ways. I thought that was an awesome film. Funny but full of objective reality and sensitive to social issues. In this film I saw true reconciliation of people divided by 2 different cultures. It's heartwarming to see these guys working together for the sake of the country. Australians are shown as compassionate people. It’s well-deserved; unlike sugar-coated compassion peddled by some politicians to keep immigration issues kept well hidden under a pile of carpet. The film showed that compassion transcends culture and identity. Genre was well played and summarily exhausted. And yes, I’d say..it kind of reminded me of that The Gods Must Be Crazy movie. Very funny understatements, clever plot and good, precise editing. Lots of characters, too! Tho’ some characters faded into oblivion and lost their paths;-) I enjoyed the shifting of emotions and sympathy for characters. I suggest you see this terrific Australian movie; this one is not for the malls. To appreciate it is to acknowledge the different emotional states people could be subjected to by the ever-changing political climate. Tolerance and compassion shall win over self-defeatism, fatalism and pragmatic attitudes. The film also reminded me of the sufferings endured by early Australian pioneer-explorers like Matthew Flinders, William Dawes, Burke and Wills in this unforgiving desert continent. It dawned upon me that these film characters now became explorers incarnated, masochistically relishing the tyranny of distance, blindly servile to an invisible but universal intent to explore and take big risk. I’ve cornered Ken while he sipped his latte. just 15 minutes ago. Arrgh, the refugees’ panicky voices still ring fresh in my ears. I enjoyed the film. Congrats bro! Did you enjoy outdoor movie set and playing a significant role there? One more thing, awesome cinematography! I thought I stepped into one of Sir Arthur Boyd’s paintings. KM: Hi Edd! Yeah I did enjoy the shooting of Lucky Miles. We also filmed in South Australia to represent Western Australia and we basically spent 6 weeks in the middle of nowhere. The main shooting was done in an area six hours north of Adelaide, past the Flinders Ranges and it’s a kind of landscape I have never seen before. EA: How long did it take to film under those dreadful, hot conditions? KM: The filming was 8 weeks all up. EA: That’s harsh! Pardon the pun but it sure was a hard act to follow. I could understand all the personal sacrifices. Have you been acting for quite a while now? KM: I have. I started acting in 1992. EA:How old are you now? EA: Any other film project after Lucky Miles? in the gold coast and that’s just about it. EA: I reckon the film captured visually the real, geographic Australia. However with regards to the Australian people, would you agree with the plot and political lines of the movie? I mean contemporarily..you know, boat people, human trafficking, strict Australian immigration laws, coastal security, etc. KM: Definitely, yeah, even if there’s only 4 major Australian characters in it, it’s very Australian in flavour. It’s got a great landscape and director Mike has given the film various specific and wry Australian sense of humour. It’s a very Australian film and yet very different from any other Australian film. EA: So why a Filipino playing the role of Cambodian? EA: I thought I saw your face before on tv, did you appear at Neighbours? EA: Stars will always shine, you will be for sure. KM: My friends call me cheap all the time. I don’t know what they mean. EA: Will Lucky Miles be shown abroad? KM: Definitely Edd. There’s an international film competition next month, The Karlovy Vary where Amelie you know that French movie that won an award there. Yeah we’re doing the international film festival circuit this year and hopefully there will be other cinema releases outside. Definitely there will be a cinema release in July in Australia. On the 20th of June we will be at the Sydney Film Festival. EA: You were born in..? EA: When did you come to Sydney? KM: We arrived in Sydney in 1989 but we came from Seattle. We all came as a family. EA: You think acting will be your real, serious career? EA: Did you go to any acting school? KM: I went in an acting school in Kensington, pursued Dramatic Arts, finished there in 1995. I was first Filipino to graduate there which Is great. EA Wow, good to hear you’re a pioneer there. Any inspiring words for our young Fil-Australians here? KM: Just keep at it. The more of us,the better the competition and the better this town would be. EA: Suffice to say there’s no glass ceiling for Filipino-Australians and other Asiatic people for the film industry? EA: Got any other skills Ken, aside from acting? KM: I do graphics and design; I’m a mean karaoke singer:) Also did stage, I was in Lion King which went to Melbourne and then to China. EA: Thank you and good luck to you Ken. It’s wonderful to meet a guy from Lucky Miles in person. Proud of you and our pinoy DNA! KM : Thanks Edd. All the best to our Filipino-Australian community. Kenneth Moraleda (born April 17, 1973) is an actor. 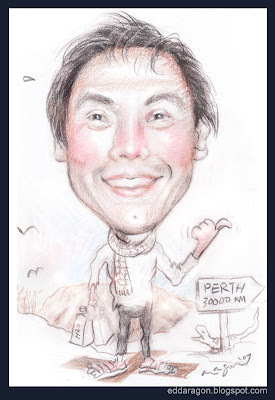 Of Filipino descent Kenneth Moraleda was born in Cambridge,Massachusetts,USA and has lived in Seattle, The Philippines and now calls Australia home. Kenneth trained at Australian Theater for Young People (ATYP) before being accepted into the prestigious National Institute of Dramatic Art (NIDA) graduating with a Bachelor of Acting in 1995. 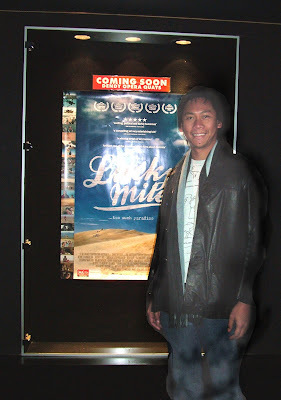 Kenneth’s first lead in a feature film is the role of Arun in Lucky Miles directed by Michael James Rowland. Other film roles include Monsod in Miramax's The Great Raid directed by John Dahl and Tony in the short film Sweet and Sour. Numerous television credits include playing Tim Young in the SBS series Bondi Banquet, Michael Lee in City Life for South Pacific Pictures and appearances on Water Rats, Wildside, White Collar Blue, Comedy Inc. and Playhouse Disney. Notable theatre credits include creating the role of Roger Chan in Nick Enright’s A Man With Five Children for the Sydney Theatre Company directed by George Ogilvie and most recently playing Banzai in the Australian/Asian Tour of Disney’s The Lion King directed by Julie Taymor. "exciting, political and darkly humorous"
"an intriguing vision of Australia"
Brilliant. One of the great Australian films about Australia"
"a winning streak of wry humour"